The Supreme Court, on Tuesday, denied cricketer Shantakumaran Sreesanth's plea to be allowed to play in the English county circuit this season. but asked the Delhi high court to decide by July an appeal challenging a trial court order discharging several cricketers, including him, in the spot-fixing case which rocked the sixth edition of the Indian Premier League in 2013. The top court denied interim relief to the controversial cricketer, who has been banned for life by the Board of Control for Cricket in India, that he be allowed to play English County cricket on grounds that he has suffered from the ban for four years and been acquitted by a Delhi court in the case. A bench, comprising Chief Justice Dipak Misra and Justices A M Khanwilkar, said though it understood Sreesanth's 'anxiety' to play, it would like to wait for the high court's decision on the appeal of the Delhi Police challenging the trial court order discharging the cricketers and others in the spot-fixing case. The Delhi Police had arrested Sreesanth, along with cricketers Ajit Chandila and Ankeet Chavan, and others on charges of spot-fixing during the IPL in 2013. 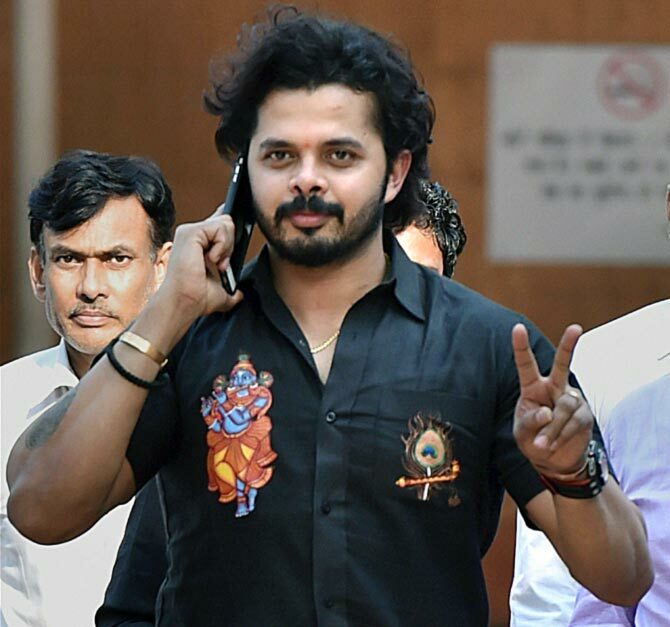 As many as 36 accused in the spot-fixing case, including Sreesanth, Chavan and Chandila, were let-off by a Patiala House court in July 2015. The Delhi Police had later challenged the Patiala high court's decision in the Delhi high court. However, the BCCI refused to alter its disciplinary decision even after the verdict. On being asked to respond, senior lawyer Parag Tripathi, appearing for the BCCI, told the court that it did not 'give him joy' to say that there is substantial evidence against the cricketer. "It was like this: 'I take money from a client and compromise his interest by taking money from the other person'," he said. Tripathi alleged the case against Sreesanth was "open and shut" as the telephonic conversations had revealed that he took money for bowling 'no balls' during an IPL match in 2013. The conversation involved talk on division of money between the cricketer and a bookie for bowling 'no balls' in a particular IPL match, he claimed. Senior advocate Salman Khurshid, appearing for Sreesanth, said, 'this is a matter of an outstanding cricketer' who has been discharged in the criminal case and has faced the ban for the last four years. He said that as an interim measure, the cricketer should be allowed play abroad in the English county during the current season. "We will ask the Delhi high court to decide the appeal by end of July. The counsel for parties shall cooperate in disposal of appeal by not taking adjournments," the bench said. The apex court had on February 5 sought response from the BCCI and two members of the committee, which had recommended the life ban on Sreesanth, over his plea challenging a Kerala high court verdict restoring the life ban imposed on him by the apex cricket body in the wake of the 2013 IPL spot-fixing scandal.